If the module proves durable at the space station, it could open the door to habitats on the moon and missions to Mars. 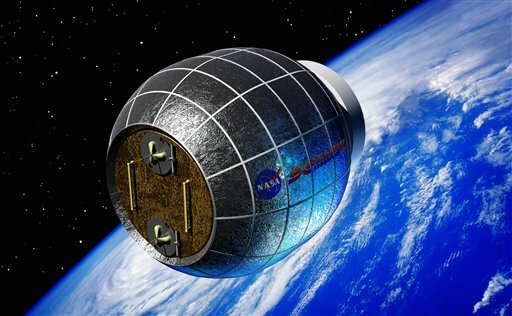 LAS VEGAS — NASA is partnering with a commercial space company in a bid to replace the cumbersome “metal cans” that now serve as astronauts’ homes in space with inflatable bounce-house-like habitats that can be deployed on the cheap. A $17.8 million test project will send to the International Space Station an inflatable room that can be compressed into a 7-foot tube for delivery, officials said Wednesday in a news conference at North Las Vegas-based Bigelow Aerospace. Founder and President Robert Bigelow, who made his fortune in the hotel industry before getting into the space business in 1999, framed the gambit as an out-of-this-world real estate venture. He hopes to sell his spare tire habitats to scientific companies and wealthy adventurers looking for space hotels. NASA is expected to install the 13-foot, blimp-like module in a space station port by 2015. Bigelow plans to begin selling stand-alone space homes the next year. The new technology provides three times as much room as the existing aluminum models, and is also easier and less costly to build, Miller said. Artist renderings of the module resemble a tinfoil clown nose grafted onto the main station. It is hardly big enough to be called a room. Miller described it as a large closet with padded white walls and gear and gizmos strung from two central beams. Garver said Wednesday that sending a small inflatable tube into space will be dramatically cheaper than launching a full-sized module. The partnership is another step toward outsourcing for NASA, which no longer enjoys the budget and public profile of its heyday. The agency has handed off rocket-building to private companies, retired it space shuttles in 2011 and now relies on Russian spaceships to transport American astronauts to and from the space station. Astronauts will test the ability of the bladder, known as the Bigelow Expandable Activity Module, or BEAM, to withstand heat, radiation, debris and other assaults. Some adventurous scientists might also try sleeping in the spare room, which is the first piece of private real estate to be blasted into space, Garver said. Bigelow said the NASA brand will enable him to begin selling Kevlar habitats several times the size of the test module. Bigelow, who launched a small prototype of the module in 2006 after licensing the patent from NASA, will rely on Boeing Co. and Southern California rocket developer Space Exploration Technologies to provide transportation. A 60-day stay will cost $25 million, which doesn’t include the $27.5 million it costs to get there and back. Bigelow predicted that the primary customers will be upwardly mobile countries including Brazil, Singapore and the United Arab Emirates that “have a difficult time getting their astronauts into orbit” and could use a private space station to barter and build up prestige. The biggest technological challenge will be transporting the collapsed module through the sub-zero temperatures of space without tearing or cracking any part of it, Miller said. When it arrives at the space station in 2015, scientists will blow it up and let it sit for a few days to test for leaks. If it does not hold as promised, NASA will take back a portion of the already bargain basement price it paid Bigelow. Standing beside scale models of research stations on Mars and the moon, Miller said the project will encourage commercial ventures to follow the path NASA blazes into space. He added that it could also help achieve the holy grail of space exploration: missions that send astronauts out of orbit for more than a year.